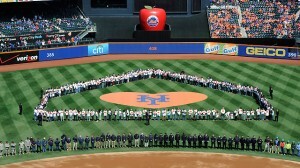 In addition to a great ballgame, the Mets honored the heroes of Superstorm Sandy. It’s too bad championships aren’t won on Opening Day, because the Mets would be a dynasty. New York is now 34-18 all-time to start the season, and 34-10 since losing their first 8 Opening days. The Mets started off the 2013 season with an 11-2 victory over the Padres. Yes, there are 161 games to go, but with all the negativity surrounding this franchise, an energetic win such as this can only help a beleaguered fan base. Heck, some people are already thinking Wild Card. Of course, this Opening Day worked out much better than the one in 1994, which was a real Tuffy for Dwight Gooden. Also opening up the season is the newly minted Triple-A affiliate for the Mets, the Las Vegas 51s. Here’s the Opening Day roster. Stay off the strip, boys. The Mets much-maligned outfield looked good on day 1, with Collin Cowgill, Marlon Byrd, and Lucas Duda all contributing. For all the competition this Spring, isn’t it odd that there are no platoons? In another Opening Day subplot, 14-year minor league veteran Scott Rice made his major league debut in the ninth inning for the Mets, and retired the Padres in order. 14 years in the minors…the lefty is either extremely persistent or completely insane. But he’s easy to root for. Finally, another Mets LHP you might have heard of, Johan Santana, had successful shoulder surgery. So, it’s back on the mound, right? Of course, Johan has another long road of rehab ahead of him. And we Mets fans are left with wistful memories of his time in New York. Coming up…game 2! Matt Harvey will make his season debut. Make sure you come back to Mets Today for opinions and reactions. Back What Is the Mets Strength? Since the Mets have written off 2013 already, maybe we should turn our attention to Vegas. Maybe I got it backwards. Maybe Wheeler and d’Arnaud are in AAA not because the Mets are cheap but because the Mets want Vegas fans to have someone to cheer for. Or did the Mets punt on that team, too?